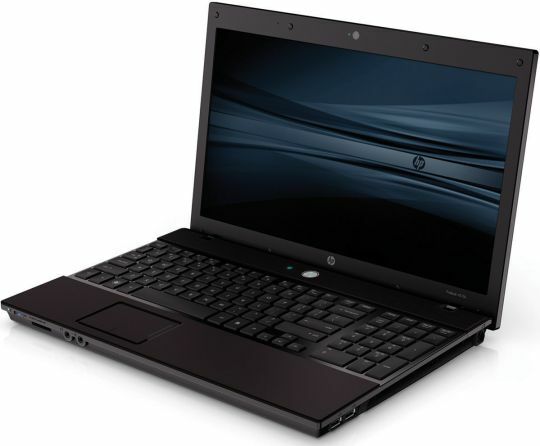 HP ProBook 4510s is business notebook that belongs to that elusive stage when latest hardware hits mainstream but still far from outdated. Notebook has one of those newer 15.6” screens plus fancy keys-stick-out keyboard (someone please tell me proper word for it). Adds up to really interesting looks. I can easily see it as home notebook. As for business one it looks very good. HP had early start with their design commitment and their recent notebook lineups look really good. My only gripe with frame is plastic used for touchpad and around. It gets covered with fingerprints like no other non-glossy surface I’ve ever seen . For second and third notebook I had literally washed my hands before even touching them. Didn’t help much. 37,18 x 24,96 x 3,15 cm, 2.6 kg. ExpressCard slot is 34mm (thin one), might be unpleasant surprise for those who use 54mm peripherals. 4xUSB ports are situated in blocks of two on sides and are closest to user. Honestly I am clumsy so I prefer USB ports far from me. I think such layout could be convenient for more portable notebook, but for one primarily used on table it makes little sense. Took me some time to find charge indicator (not near HDD one) – tiny and above power socket. Reviews and specs around usually list impressive 7 hours from battery, but that’s only for models with integrated video. For discrete it is ~4:30 according to official specs. BIOS is interesting – it got actual GUI with touchpad/mouse support. More user friendly but feels like it lags a bit, maybe after many years of those ugly but fast text-mode blueish screens. Notebooks came clean with FreeDOS, but that might not be an option in other regions. Windows XP is properly supported with all of drivers available. Only issue I encountered (2 of 3) was part of ATI drivers to output audio through HDMI. It locked audio to itself and notebook went mute. I had no extra time to figure it out so simply disabled problematic driver in device manager. One of the most interesting models I’ve dealt with lately and good feedback from users so far. In addition to business origin this notebook also packs looks (and optionally computing power) that let it pass for multimedia PC quite easily. I am a big big fan of HP. Their customer service rocks. I have one myself, and ran into some problem with it after around 2 years. Their customer service guys patiently helped me out even though warranty had expired long back. On the contrary, I had to pay Dell customer service to talk to them, just one day after expiration of warranty. BTW – I liked this concept of reviewing a product, and then adding an Amazon link for that. Really cool. Will try it sometime. I actually don’t encounter HP notebooks often, mostly Acer around here. As for affiliate stuff at this blog things are kinda slow. :) Overall I barely touched monetizing and it’s unlikely this blog will bring considerable sums until third year (at least) with such pace. wow.. you have very long term plan for this blog. That’s great. We were pretty skeptical about these due to the sub 500 price tag from our vendor, but bought one anyway as a swap out for one of our users. It’s great so far. The one problem we ran into with it was the Vista pre-install screwed up the initial XP installation. You have to wipe the disk with 3rd party tools (we zero’d it out using a utility from UBCD.) Don’t bother with the Vista/XP partition/formatting. After that, ran like a dream. Some little driver problems since, like the HP Bluetooth utility. But overall a great notebook. It actually runs BusinessMAP pretty well! For clean XP installs what I usually do is completely delete and re-create partitions when asked to choose one during setup. Don’t think it ever failed me.